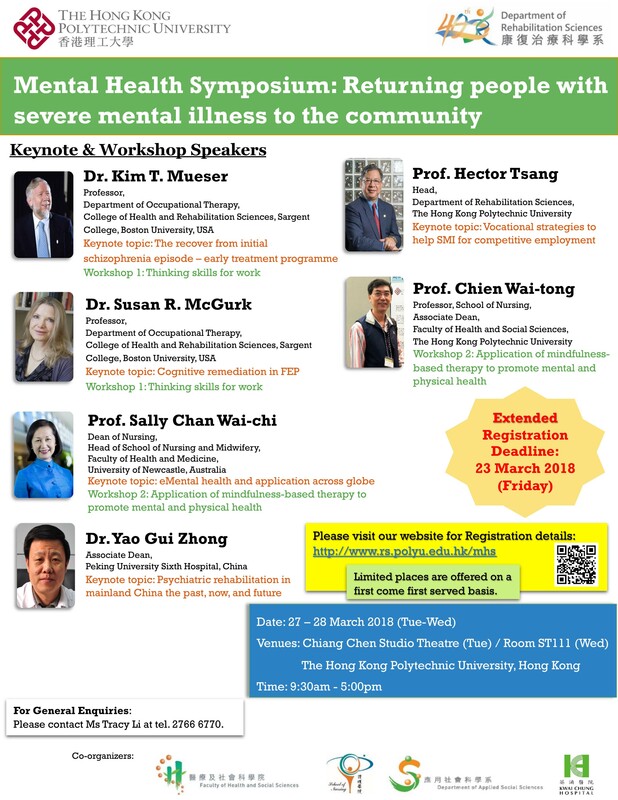 On behalf of the Organizing Committee of the Mental Health Symposium 2018, I would like to extend a sincere invitation to you to join the symposium, which will be held on 27 and 28 March 2018 at the main campus of The Hong Kong Polytechnic University (PolyU). PolyU’s Department of Rehabilitation Sciences is the main organizer of the symposium, while the co-organizers are PolyU’s Faculty of Health and Social Sciences, its School of Nursing and its Department of Applied Social Sciences, and Kwai Chung Hospital, Hong Kong. The theme of this symposium is “Returning people with severe mental illness to the community”. 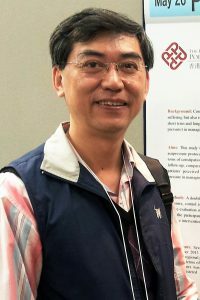 We are very honoured to invite a number of distinguished overseas, mainland Chinese and local scholars to deliver keynote presentations and conduct workshops at the symposium. Before the end of the symposium, there will be an open forum to allow participants to ask questions and express opinions on issues related to the theme. In addition, the symposium is one of the Department of Rehabilitation Sciences’ celebratory events for its 40th anniversary in 2018. I am confident that this symposium will be a fruitful and memorable experience for all participants. I look forward to welcoming you at the Mental Health Symposium 2018. 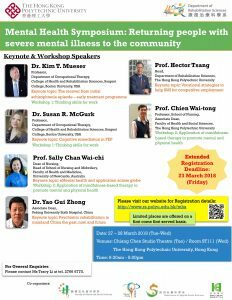 I would like to take this opportunity to congratulate our Faculty’s Department of Rehabilitation Sciences (RS) in taking the lead in organizing the Mental Health Symposium 2018 at The Hong Kong Polytechnic University in collaboration with the Faculty, our School of Nursing, our Department of Applied Social Sciences, and Kwai Chung Hospital. I am delighted that this very meaningful symposium will be one of RS’s celebratory events for its 40th anniversary. The theme of the symposium is on an important global issue: how to help people with severe mental illness (SMI) return to their community. All of the international keynote speakers are renowned in this field. I believe that the symposium will help update participants’ knowledge on the latest developments in psychiatric rehabilitation models and interventions from both overseas and in mainland China and Hong Kong. Past symposiums and forums on mental health that have been organized or co-organized by our Faculty’s Departments and Schools have been warm and welcoming gatherings. I am confident that the forthcoming symposium on 27 and 28 March 2018 will be no exception, and I look forward very much to welcoming you to our University and city. It is my pleasure and honour to invite you to the Mental Health Symposium 2018 organized by the Department of Rehabilitation Sciences of The Hong Kong Polytechnic University (PolyU) in celebration of its 40th anniversary. I am very delighted to welcome you on behalf of one of the co-organizers, PolyU’s Faculty of Health and Social Sciences. Through this symposium, we would like to engage with all of you in open and constructive dialogue and sharing about issues and strategies in helping people with severe mental illness (SMI) return to the community. Issues in rehabilitation and recovery in mental health care services or settings have been attracting much attention gobally. Professionals involved in mental health, such as mental health nurses, occupational therapists, social workers, and clinical psychologists, are key workers in ensuring a more therapeutic and person-centred care for people with mental health problems. In response to the rising demands and complex mental health needs of SMI patients, community-based psychosocial interventions and rehabilitation programmes have been increasingly developed and tested. These programmes aim to enhance the quality of life for SMI patients and their families, meet their complex psychosocial needs, and ensure their inclusion and participation. However, there is very much a need for sharing the successes and challenges of the implementation of these programmes, the current situation and future development of the rehabilitation services, and interdisciplinary sharing and collaboration within such a mental health care context. I look forward to seeing you at PolyU and at the symposium. I hope all delegates will find the symposium fruitful and inspiring. I also wish overseas delegates a very enjoyable stay in Hong Kong.